The spectre of disappointment continued to hover around the Indian camp on Thursday, the third day of the Malaysia Open badminton championships, as fifth-seeded Pusarla V Sindhu surrendered with barely a whimper to her unseeded nemesis, South Korea’s Sung Ji-hyun, leaving Kidambi Srikanth the sole Indian survivor in the $700,000 prize money World Tour competition. The Indian was not unduly stretched as he slashed Thailand’s Khosit Phetpradab down to size by a 21-11, 21-15 scoreline in two minutes over the half-hour mark, in what was their first-ever meeting. The 26-year-old Guntur lad was sharp, swift and aggressive, and never looked in trouble against the Thai, two years his junior, and ranked eleven places below him, at No 18 on the Badminton World Federation (BWF) ladder. Srikanth booked a quarter-final meeting with China’s two-time former world champion and reigning Olympic gold medallist, Chen Long. The fourth-seeded Chen took another Thai, Kantaphon Wangcharoen, is his stride with a fluent 22-20, 21-13 triumph, and will fancy his chances against Srikanth, whom he has beaten five times in their half-dozen career clashes. However, the tall Chinese player’s form in recent times has fluctuated wildly between the sublime and the pedestrian. At the Swiss Open, barely three weeks back, Chen had suffered a humiliating straight-games defeat at the hands of Srikanth’s stable-mate at the Pullela Gopichand Academy, B Sai Praneeth. 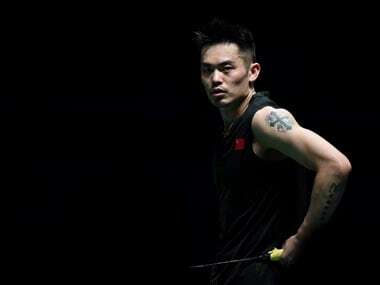 What may worry the 30-year-old Chinese star is the fact that his most recent encounter with Srikanth, at the Australia Open, nearly two years ago, had ended in a 22-20, 21-16 victory for Srikanth when the latter was in the midst of the hottest winning streak of his career. The latter has not been able to recapture that tremendous form, but then, Chen is also nowhere near as formidable as he was when he dominated world badminton between 2014 and 2016. As for Sindhu, it was not so much that she lost to the South Korean for the third straight time, to leave their head-to-head meetings record tied at 8-all, as the manner of her loss. What was disconcerting was the full extent of her capitulation in their second-round duel – the lanky 23-year-old Indian was comprehensively beaten at 18-21, 7-21, without putting up even the semblance of a fight in the second game. It must be mentioned that Sung, the daughter of former Korean internationals Sung Han Kook and Kim Yun Ja, appears to be one of the most laid-back players on the circuit. But that apparent lethargy is highly deceptive; she manages to reach everything, and her courtcraft is cannily tailored to deal with her opponents. Sindhu is one player she has enjoyed great success against in recent times, with a solitary loss in their last five duels. The Indian’s only success against the Korean in the past year was at the World Championships in Nanjing, when she was in great form, and went all the way to the final before faltering against the reigning Olympic gold medallist and two-time former world champion, Carolina Marin of Spain. Sung has won in last April’s Badminton Asia Championships, at the Hong Kong Open last November, at the All-England Championships last month, and now at the Malaysia Open. Sindhu opened quite brightly, and led all the way until 14-12 in the opening game, but then collapsed after a string of unforced errors, conceding the crucial 20th point after a brief fightback to 18-19. It was disconcerting for the Indian supporter to see the furrows of worry creasing her brow at crucial stages of the opening game. Many had hoped she had left that kind of indifferent body language behind after winning the BWF World Tour grand finals in Guangzhou last December. The second stanza was positively embarrassing, from the Indian point of view. The 27 year old Sung shot into a 5-0 lead, which she simply went on building up until the mid-game interval was reached at 11-6. Thereafter, Sindhu picked up a solitary consolation point as the Korean streaked to the tape with an unbroken 10-point reel, made up more of Sindhu errors than any positive points from her own racket; and completing her best-ever victory over her younger arch-rival. The eclipse, on Wednesday, of eighth-seeded Saina Nehwal at the hands of the former World junior runner-up, Pornpawee Chochuwong of Thailand – due mainly to the fact that the 29-year-old Indian did not seem fully recovered from the severe bout of gastroenteritis that had ruined her campaign at last month’s All England – meant that the much-vaunted Indian challenge in the women’s singles came to an end. The same result prevailed in the mixed doubles where the solitary Indian pair of Pranaav Jerry Chopra and N Sikki Reddy met their Waterloo at the hands of Malaysians Tan Kian Meng and Lai Pei Jing after a protracted 56-minute second-round battle, at 21-15, 17-21, 13-21. The Indians, who had crossed their first hurdle on the opening day of the competition by sidelining the Irish brother-and-sister pair of Sam and Chloe McGee at 22-20, 24-22, were right on top in the opening game against the Malaysians, but could not sustain their efforts in the two games that followed, and went progressively downhill. It must be conceded that the Malaysians Tan and Lai were a pretty strong pair, having downed the third-seeded Japanese combination of Yuta Watanabe and Arisa Higashino by a facile 21-16, 21-15 scoreline in their opening encounter. The lesson to be learnt was clear – Chopra and Reddy did not lack for skills, but needed to up the ante on their fitness levels. The heart-breaking result that Reddy and Ashwini Ponnappa had obtained in their women’s doubles first round – a 20-22, 21-17, 20-22 loss to South Koreans Baek Ha Na and Kim Hye Rin, after holding four match-points at 20-16 – could be viewed in the perspective of the Koreans’ resounding 21-18, 22-20 triumph on Thursday against the second-seeded Japanese duo of Ayaka Takahashi and Misaki Matsutomo. It could so easily have been Reddy and Ponnappa contesting Friday’s quarter-finals!